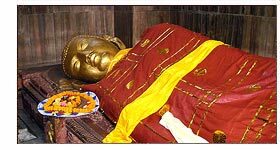 Kushinagar is another principal centre of Buddhism, worth a sincere admiration, is the place where Lord Buddha passed away at this place near the Hiranyavati River and was cremated at the Ramabhar stupa. It was once a celebrated center of the Malla kingdom. Many of its stupas and viharas date back to 230 BC-AD 413. when its prosperity was at the peak. In 543 BC, on a full moon night of Magh the legend delivered lecture to his Sangha and declared that he is going to leave the mortal world soon enough. The excavations led by general Cunningham has revealed some antique artifacts and structures related to all sects of Buddhism. Kushinagar also expresses the common thread of all sects of Buddhism through its magnificent Viharas, Chaityas, temples and Tibetan monasteries. In ancient times, the town was also known as Kushinara and Kasia. Kushinagar is situated at a distance of 53 km west of Gorakhpur, in Uttar Pradesh, in the northern part of India. Nirvana Stupa and temple - This stupa made of bricks, excavated by Carlleyl in 1867, stands at a height of 2.74 meter. The excavations leading to the finding of the copper vessel and the Brahmi inscription on it proving the matter that Buddhas ashes were buried in the pace, made this place a suddenly important destination for all Buddhists devotees. Besides, the huge reclining statue of Buddha in the temple is also very attractive. Mahaparinirvana temple - This is more than 6 meters long statue of reclining Buddha. The image was unearthed during the excavations of 1876. Carved from Chunar sandstone, the statue represents the dying Buddha reclining on his right side. Wat Thai temple - The unique temple, built to celebrate the victory of King Bhumibol's great accession of the throne, and the subsequent Golden Jubilee, is worth a watch, especially because of the innumerable trees that were planted here.Besides, there's the Chinese temple, the Meditation Park and an International Buddha trust, and the Birla temple to add charm to roaming around in the city. 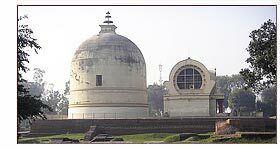 Ramabhar Stupa - About 1.5 km away from Mahaparinirvana Temple, this large Stupa rises to a height of 49 ft. It marks the site where the Lord Buddha was cremated. In ancient Buddhist texts, this Stupa has been referred to as 'Mukut-Bandhan Vihar'. Japanese temple - A beautiful eight metals statue of the Buddha, which was brought from from Japan, can be visited here. Gorakhpur - Gorakhpur is an important Hindu destination, due to the numerous temples, including the Gorakhnath temple, the Vishnu temple, gita Vatika, Gita press, and the Arogya Mandir. Besides, there are important institutions of other religions such as the Imambara. The planetarium and the circuit house are also worth a visit. Lumbini - This immensely important Buddhist pilgrimage, the birthplace of Lord Buddha, is in Nepal, at a distance of 122 km from Gorakhpur, houses some of the most important artifacts of literature and art related to the life of Lord Buddha. Air - Gorakhpur is the nearest airport, at a distance of 44 kms from the place. Kasia airstrip-5 Kms, Amausi airport Lucknow-252 Kms, Babatpur Airport in Varanasi-286 Kms. Rail - The nearest railway station, a convenient one, is Gorakhpur, which is linked to important railway stations. Road - The national highway numbered 28 connects the place with other important destinations of the state. There are accommodation facilities available, in the Dharmashalas and other charitable trusts. In Kushinagar, there's Hotel LOTUS NIKKO IS 55 kms from Gorakhpur railway station. International Guesthouse, Hindu brila Buddha Dharmashala, Nepalese Dharmashala etc are good places to stay. The UP Tourism accommodation, the Pathik Niwas is also quite good.